The starting point for Walker’s goals, and for the plans of others sitting at high metal desks, is a Virginia Beach classroom. Here, decorated with nautical charts and prints of tall sailing ships, is the home of the Hampton Roads Maritime Training Program at Tidewater Community College. Since 1998, the school has presented this program to help people who work on, or just love the water, chart new careers or second incomes. For Walker, it’s the OUPV or “Six Pack” license that he believes holds the key to the future. OUPV stands for Operator of Uninspected Passenger Vessels, the Coast Guard license required by those operating vessels for hire carrying no more than six passengers. Following a discussion by the instructor about the sea service and the other “Six Pack” licensing requirements, Walker lays out his plan. “Here, students receive a good foundation in ‘rules of the road,’ navigation, seamanship, firefighting, lifesaving, aids to navigation, all the subjects required by regulations,” says the day class instructor Bob Vollbrecht. Vollbrecht is a retired Coast Guard officer, Coast Guard academy graduate and has been a maritime instructor for 22 years. “If students pass our exams they will not have to take the Coast Guard test for that license. And we’ll help them with the paperwork they need to ultimately get one, if that is what they want.” Vollbrecht explains to the class that after passing the course, students have one year to fulfill the additional Coast Guard license requirements such as first aid and CPR training, physical exams, and documentation such as letters of recommendation and proof of sea service. After the OUPV course, some students might opt to stay on for additional classes at the Maritime Training Program. Additional hours can qualify students for a 100 Tons Master’s License while other training is offered to meet requirements for Radar Observer, Automatic Radar Plotting Aids (ARPA), Flashing Light Signaling Examination, Assistance Towing and more. Mike Valentine of Ashland has plans to start a charter business in Virginia Beach. James Best works for NOAA and would like to one day serve on tugs so he can return home to his family at night. Chris Burke from Richmond took an early retirement, and while he’s not sure he wants a license, he does like the idea of knowing more about what he’s doing on the water. And Tim Waters dreams of moving to Florida to start a charter business there. For each story in the class, there is one common thread — a love for the water. With a skilled staff, computer assisted workstations, a full-sized simulator and a 15-year track record of success, the Hampton Roads Maritime Training Program at TCC offers a real chance to start turning that love into something more. 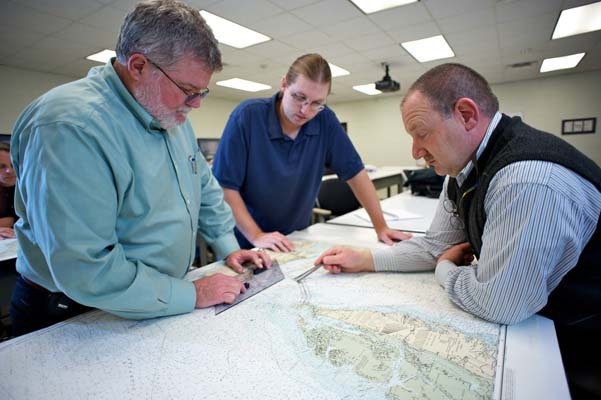 Day classes for the Hampton Roads Maritime Training Program at TCC are held every other month at the Virginia Beach Campus. Evening class sessions are formed twice each year. For more information or to register, call (757) 822-7733.